The original Fantasia could be considered one of the first blockbuster movies for Walt Disney that not only showcased the potential of animation but merged it with music to create a very surreal and dare I say, magical journey as it played with your visual and auditory senses. At just over 2 hours long, Fantasia is a true golden age of Hollywood epic masterpiece that unlike Snow White and Pinocchio before it, created its own modern fairy tale adventure. It also pushed the boundaries of society's norm as cartoons were for not just for children but rather for everyone. In terms of stories, the most memorable aspect of Fantasia is the Sorcerer's Apprentice that starred Mickey Mouse as the apprentice to a wizard called Yen Sid (Disney backwards). Needless to say, Mick gets involved in all sort of antics when he believes that he can control his master's magic. From there, the story moves into a variety of strange and twisted fairy tales, all focused on animation and music. It must be experienced to be understood. The video quality of Fantasia looks amazing on 1080p. Even though it has been painstakingly converted to this format, the images, colours and overall animation looks thoroughly amazing. Best of all, those responsible for cleaning up the footage have not sacrilegiously destroyed what came before it but rather enhanced it for today's standards. The highlight of Fantasia and just like the original are the vibrant colours that still jump straight at you and almost come alive, just like the movie. It may not be as perfect as animated films of today but considering the age (1940 to be precise), this is as good as they come. 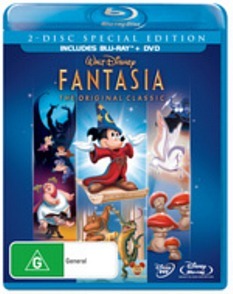 However what makes Fantasia so impressive on Blu-ray is the 7.1 DTS-HD master audio tracks which sounds amazing. Every instrument in the majestical soundtrack of Fantasia can be heard and more importantly, it makes full use of your surround sound system. It's also one film that must be heard loud in order for it to be fully enjoyed as the experience is quite surreal, like being part of a classic orchestral concert. Apart from the Blu-ray version of the movie, it comes with the DVD version of the film as well plus a Disney Family Museum featurette. This featurette is found on both versions of the movie and takes the viewer on a historical journey through Disney. Add in some interactive art, a notebook about Disney Treasures and audio commentaries and this is easily the definitive version of the 1940 classic. In the end, Fantasia inspired a whole new generation to appreciate cartoons or animations that not only pushed the boundaries of what animation could do but proved that a full length animated feature film could work. It's a modern day fairy tale that merged with the Disney universe that features colourful explosions and music that will reverberate through your body, creating an almost epiphany as you are drawn into the surreal story. The restoration of Fantasia on Blu-ray must be seen to be believed thanks to its exceptional video and audio quality. I have harped on throughout this review of how good the story and restoration was... unfortunately or fortunately I cannot fault it. Wherever Walt Disney is today, he would be proud to see his creation come to life one more time! Highly Recommended!